13 Sep 2017 --- The world’s leading cocoa and chocolate companies are working with the governments of Côte d’Ivoire and Ghana to double down on plans to end deforestation and forest degradation in the cocoa supply chain. Over the last six months, the number of companies committed to action has surged from 12 to 35 industry partners, including chocolate makers, cocoa producers and traders, retailers, as well as companies that use cocoa in consumer products ranging from breakfast cereals to after-dinner sweets. The industry group and the two countries’ governments have worked closely with environmental groups, international development and civil society organizations, and cocoa farmer associations, through a series of intensive face-to-face discussions involving more than 500 people. Together, they are developing a blueprint, or Framework for Action, for achieving a deforestation-free cocoa supply chain – and this framework will be presented in November at the UN Climate Change Conference (COP23) in Germany. Encompassed under a partnership called the Cocoa & Forests Initiative, the effort draws on lessons learned and good practices from global efforts to reduce tropical deforestation in other commodities and sectors. 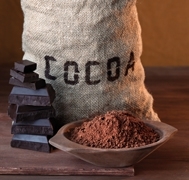 The work is coordinated by the World Cocoa Foundation (WCF), IDH - the Sustainable Trade Initiative, and The Prince of Wales’s International Sustainability Unit. Cocoa & Forests Initiative partners are united in their commitment to decisive action to end deforestation, protect forests, and help the farmers in Côte d’Ivoire and Ghana who rely on cocoa farming in protected forest areas for their livelihood. Restrictions on production and sourcing of cocoa in protected forest areas. Protection and restoration of forest areas, including strong forest law enforcement. Developing alternative livelihoods for farmers who currently depend on cocoa production in protected areas for their income and employment. Improved mapping and data collection of forest and agricultural areas. Greater transparency in the supply chain with the goal of tracking the origin of all cocoa production at the farm level. According to the World Cocoa Foundation, these actions will be supported by comprehensive monitoring to ensure effective reporting and accountability of government and company commitments. “We recognize that the current model of cocoa production, which revolves around very small, family-owned farms that too often provide barely enough income to support basic family needs, has been a major driver of forest loss in West Africa,” says WCF President Rick Scobey. Meanwhile, the two West African governments have welcomed the Cocoa & Forests Initiative. “Côte d’Ivoire, the world’s leading producer of cocoa, is proud to join with the private sector, environmental organizations, donors and others to formulate a Framework for Action that will correspond to the realities and needs of Ivorian cocoa farmers and their communities,” says Mamadou Fofana, chief advisor to the president of Côte d’Ivoire for issues related to the environment, sustainable development, water and forests. Also welcoming the progress made so far through the Cocoa & Forests Initiative is Joseph Aidoo, CEO of the Ghana Cocoa Board. “The convening of the private sector alongside government, civil society, and others is helping Ghana to accelerate our efforts to meet the UN REDD+ commitments we made at COP21,” he says. The Cocoa & Forests Initiative is coordinated with a wide range of global and local environmental organizations, including the Tropical Forest Alliance 2020, Rainforest Alliance, and World Resources Institute. The work to date has been supported by several development partners, including the UK government’s Department for International Development, the Dutch Ministry of Foreign Affairs, the World Bank, the International Finance Corporation, and the Green Commodities Program of the United Nations Development Program. Cocoa Chocolate Ghana Côte D’Ivoire World Cocoa Foundation West Africa Deforestation.